Despite repeatedly announcing his intention to present a bold, sweeping plan to solve the Israeli-Palestinian conflict, U.S. President Donald Trump continues to keep everyone waiting. If he ever does present his plan, it is set to backfire, for several reasons. For one thing, the Trump administration has been shunned by Palestinians since it recognized Jerusalem as the capital of Israel last December. Palestinians were angered by the move, arguing that the U.S. government violated its role as mediator and sponsor of the peace process by adopting Israel’s position on Jerusalem. Palestinian leaders have taken the unprecedented step of halting all contacts with U.S. government officials in order to discourage the administration from presenting a peace plan that they fear will be just as biased. That antipathy will only deepen if the plan is released. For another, key Arab countries, contrary to dramatic leaks of anti-Palestinian statements amplified by the Israeli government and right-wing media in Israel, are opposed to these new hard-line American positions. They don’t want the U.S. government to present its plan. That Arab position, underscored at the most recent Arab League summit in Saudi Arabia, is not so surprising. At a time when Saudi Arabia is facing challenges to its leadership in the Islamic world from both Turkey and Iran, it cannot be expected to participate in an unpopular proposal to gift Jerusalem—Islam’s second-most revered holy site—to Israel. Jordan is in a similar position. As custodian of the holy sites in Jerusalem, with an outspoken public that is predominantly Palestinian and Islamist, Jordan cannot afford to cosign any plan that legitimizes Israeli control over the city. A less visible factor is that, unlike evangelicals in the United States, many Christians in Europe and elsewhere do not feel comfortable giving Israel what could amount to unrestricted hegemony over the holy city of Jerusalem. The two-state solution, as envisioned by its many architects, always provided for the idea of equal access to the city for Jews, Christians and Muslims. Europe is the strongest advocate for the two-state solution and has the greatest political and financial investment in its implementation. There are, of course, political reasons for this, but Jerusalem also includes Christianity’s holiest sites, such as the Church of the Holy Sepulchre, and Christians around the world seek to maintain their ties and access to the city. Recent conflicts over Israeli taxes on church property, land disputes and access restrictions to the city all highlight this tension. But the most significant reason why Trump’s supposed “grand deal” would provoke a major backlash is that the Israeli coalition led by Prime Minister Benjamin Netanyahu is not actually in favor of an American peace proposal. Few observers have bothered to note that Netanyahu has never referred favorably to the “deal of the century,” and certainly cannot be found on the record urging Trump forward. There is no longer a majority—or even a minority—in Netanyahu’s right-wing coalition that is prepared to give up Israeli control over any part of the occupied West Bank, which includes East Jerusalem. Thus, a peace proposal from Washington that references a two-state solution or a Palestinian state will force Netanyahu to choose between his government coalition and his valuable relationship with the Trump administration. 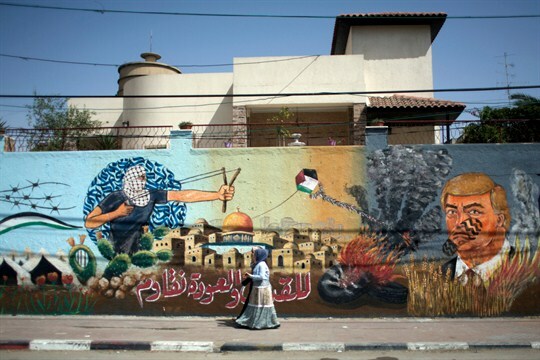 Graffiti showing U.S. President Donald Trump with a footprint on his face and Arabic that reads, "For Jerusalem and the right of return, we resist," Gaza City, May 20, 2018 (AP photo by Khalil Hamra). In light of these realities, the Trump administration seems to have adopted Israel’s unilateral approach to the conflict, trying to force through aspects of its plan gradually rather than using bilateral or multilateral diplomacy. Finally, the Trump administration is trying to implement Netanyahu’s so-called regional approach by unsuccessfully wooing Arab countries to establish normal relations with Israel, despite the continued occupation of the Palestinian territories and the Golan Heights. Israel annexed the latter in 1981, a move Syria and the rest of the world never recognized. In another sign of shifting American policy, the State Department, for the first time in nearly 40 years, removed the word “occupied” when referring to Palestinian territory in its annual report on human rights. Taken together, all these steps indicate that the Trump administration is in fact not developing its own ideas and holding consultations, but rather working closely with Israel to enforce its ally’s go-it-alone strategy. But this new American-Israeli approach is headed for failure. It has neither regional nor international backing, but more importantly, it cannot succeed without Palestinians, who are adamant on referring to international legality and instruments—the basis for the establishment of two states recognized by the United Nations—regardless of the short-term costs. The only area where Trump and Netanyahu might make some headway is in the Gaza Strip. Israel continues to entrench the existing territorial and political divisions between the West Bank and Gaza. That will serve Israeli strategic interests of undermining the possibility of a two-state solution and making Gaza Egypt’s responsibility—one of the objectives of Israel’s military withdrawal from Gaza in 2005. But at the same time, Israel is deeply concerned about rising tensions in Gaza, which has been under a strict blockade from Israel and Egypt for more than a decade now. As Israeli army officials have said, Gaza’s widespread economic problems are Israel’s security problems. That’s why recent American diplomacy has focused on the tiny, crowded, besieged territory where the water is not fit to drink and very few of its nearly 2 million people are allowed to leave. Providing humanitarian relief to Gaza by easing the blockade is a win-win policy, since it will serve both the political and security needs of Israel by defusing tensions. Hamas, Gaza’s de facto government, does not prioritize Palestinian self-determination and may believe that humanitarian relief can solve some of its governance shortcomings. Egypt, too, is not likely to object, because it thinks it will benefit economically from promised investment in Gaza if the blockade is eased and wants to nurture its relationship with the United States. Instead of ushering in peace, the net result of this transformed American approach to the region will further undermine the Palestinian leadership that, 25 years ago this week, completed and signed the Oslo Accord with their Israeli counterparts in Norway, gambling on the two-state solution and its vision of peace for Israelis and Palestinians. Trump is empowering the growing right-wing tendencies in Israel’s government, while echoing its opposition to an actual negotiated peace process. This Article was Published in 23rd of August in World Politics Review.